New Test Helps Predict if Relative will Awake from Vegetative State. One of the biggest challenges facing doctors and patient relatives in hospitals is when or if you should remove life support from a comatose patient. It turns out that an already common tool, positron emission tomography or a PET scan can be interpreted to determine which unconsious patients are actually brain dead (vegetative state) or merely unconscious but with minimal brain activity as shown by the traditional measure, an EKG. A PET scan actually generates antimatter (technically known as radionuclides in medical applications) in incredibly tiny quantities which can be used as a tracer. The positrons (positively charged antimatter equivalent of electrons) decay over a short period of time releasing gamma rays which are easily detectable. A common PET scan tool which uses a fluorodeoxyglucose (FDG) tracer shows changes in the glucose (sugar used by the body’s cells and an indication of activity due to energy consumption) levels of the brain. Unlike many clinical tools a PET scan is relatively simple and easy to conduct but previously they were used to detect disease - the new results show they can also indicate very low levels of brain activity. The new study of 131 patients showed The PET scan data could correctly distinguish between minimal consciousness and severe unresponsive wakefulness with 89% accuracy. An incredibly new tool helping both doctors and families determine which patients have any potential for eventually waking up. NIH researchers have discovered that two rare cancer tumors, pheochromocytomas and paragangliomas, may initially present as (appear to be) attention deficit hyperactivity disorder or ADHD in some children. If misdiagnosed as ADHD the cancers would go untreated and the children would probably be put on powerful medications (amphetamine (A.K.A. Speed) , dextroamphetamine or methylphenidate) which are powerful nervous system stimulants having some serious side effects. The study from January 2006 through May 2014 involved 43 children which had the particular cancerous tumors. Of those 43, nine, or 21 percent had erroneously been diagnosed with and treated for ADHD before the cancers were discovered. Removing the tumors stopped the ADHD-like symptoms and it is now thought that the high blood pressure which is sometimes experienced by children treated for ADHD with “speed” and related compounds, may be an early indicator that the underlying problem is actually a cancer. Is Lack of Civility Caused by Tylenol? Yes! Everyone sees the ever-lowering standards of civility in the U.S. and around the world but now Ohio State University (OSU) researchers may have found a major cause and it is a simple painkiller - acetaminophen (paracetamo), also known as Tylenol, has been shown to reduce empathy in a placebo based double-blind experiment. Simply put, the study, published online in the journal Social Cognitive and Affective Neuroscience, indicated that student volunteers showed less concern over other people’s pain when they had taken Tylenol. Another study at OSU demonstrated that acetaminophen intake also blunts positive emotions such as joy. What leads many people to treating others as they would like to be treated, i.e., with compassion and understanding, is known as empathy, the ability to understand another’s pain. Acetaminophen is the most common drug used in the United States (and likely in many other countries) and, according to Science Daily, is found in more than 600 other medicines besides those labeled as the pain killer. So, does your spouse, friend, neighbor, political leader, etc., act as if he or she didn’t really care how you feel? If so, the answer could be not that each is basically unfeeling and totally lacks empathy but that he or she had a muscle ache or headache and took a Tylenol. But this shouldn’t be a major surprise because it was already known that specific areas of the brain are involved in empathy, so it is reasonable to expect chemicals that alter brain activity could affect the feeling of empathy. The Oxford Journal of Social Cognitive and Affective Neuroscience stated as far back as 2011, "Empathy for the social suffering of friends and strangers recruits distinct patterns of brain activation" - in plain English, that means functional magnetic resonance imaging (fMRI) studies showed that people's brains actually showed certain activity when they were feeling empathy (affective pain regions). Ibuprofen is now being studied at OSU to see if that NSAID also has the same effect on empathy. But it is important to realize this isn’t a new result, there are a number of similar studies in the literature. Severe depression is life-threatening but most medications take up to several weeks to be effective. Ketamine according to clinical trials by Zarate can lift depression in hours, or even minutes. But ketamine also has dissociative and euphoric effects which would make it a prime candidate for abuse. Now a new study shows that the active part of ketamine is actually a metabolite which doesn’t have the same addictive properties. 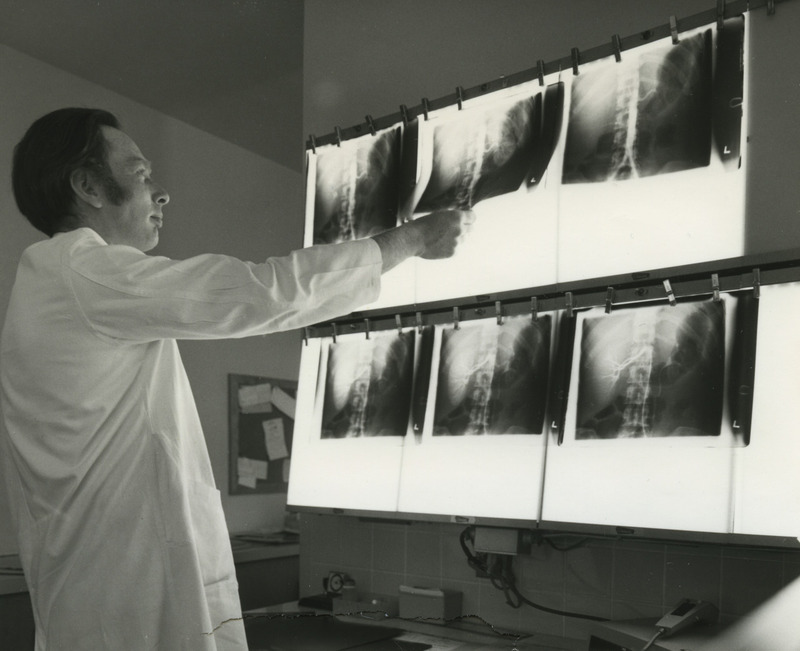 NIMH grantee Todd Gould, M.D. (link is external), of the University of Maryland School of Medicine reported the findings in the current issue of Nature. The research team looked for the exact mechanism which relieves depression in the class of drugs (including ketamine) which block cellular receptors for glutamate, the chemical which carries excitatory messages in the brain. Previously it was thought ketamine worked by blocking N-methyl-D-aspartic acid (NMDA) glutamate receptors. The NIH scientists and grantees traced ketamine’s rapid antidepressant effects to triggering AMPA receptors by (2R,6R)-HNK (above) – a completely different mechanism. This proved ineffective so the researchers looked at the the metabolites - chemicals made in the body as the body utilizes ketamine and found that the key metabolite (2S,6S;2R,6R)-HNK (hydroxynorketamine) was pharmacologically active in mice. Tests showed the metabolite (2R,6R)-HNK worked like to ketamine in relieving depression and it lasted several days although it does not inhibit NMDA receptors. These results are preliminary but hold much hope for producing a new class of fast-acting antidepressant medications which do not have the drawbacks of ketamine. According to a report by the National Academy of Sciences, the incidents of so called “air rage” that is, unreasonably aggressive behavior against cabin attendants and fellow passengers, is closely related to the increase in First Class seating. It appears that air rage is actually triggered by economy class passengers being confronted by the fact that a privileged group is having better food, more comfortable seating, and generally better treatment than they are getting - this causes the normal tensions caused by the cattle car crowding of economy class seating to boil over when there is any additional problem. “Stark differences in class,” are thought to be the base cause of many recent incidents of social unrest. It is thought that a rapidly spreading Asian tiger mosquito, A. albopictus is also capable of carrying Zika which opens up vast new territories for potential spread of the virus. This is not just another “bird flu panic” situation, it is much more like the actual Ebola threat except that it was relatively easy to stop Ebola – people with the disease quickly developed a fever and also quickly died which was terrible for them but great for those trying to prevent it spreading to the rest of the world. According to Science Magazine, the tiger mosquito was first seen in Georgia in 1983 but by 2008 it was already becoming common in 32 states. And in yet another case of unintended consequences, the recycling movement has been responsible for the mosquito’s rapid spread via used automobile tires which are practically designed to be breeding vessels for mosquitoes – if you’ve ever had one around the house you know they trap stagnant water. Japan and Germany in particular have strict rules about reusing tire carcasses for recapping or storage/disposal so millions of used tires are annually shipped from Asia and Europe to the U. S.
You might think that colder climates would slow the spread of this tropical insect but not so. It turns out that the tiger, almost exclusively of tropical insects, is well adapted to overwintering because the eggs can hibernate in cold weather. The tiger is very aggressive, so much so that in southern Italy it is actually reducing tourism which has, so to speak, come back to bite the Italians who failed to aggressively move to eradicate the tiger back in 1990 when it was discovered in a kindergarten in Genoa. 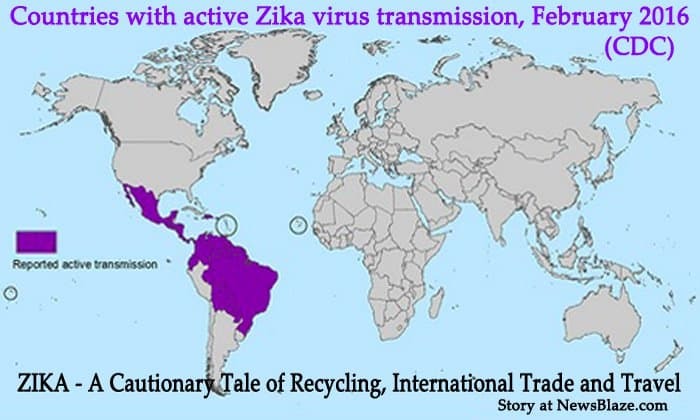 But the big news today is about Zika so let’s take a closer look at that virus. Zika can only be confirmed through PCR Polymerase Chain Reaction DNA analysis and, since most people don’t even know they have been infected, most people will never be tested. That makes it extremely difficult to determine if the surge in reported cases of birth defects in northern Brazil are actually due to Zika. There is no treatment for Zika, as is true for most virus infections; fortunately even people who have a severe infection with strong symptoms are hardly more inconvenienced than they would be with the common cold – that means that, other than the most vulnerable (elderly or otherwise weakened) individuals, few will require more than over-the-counter palliative treatments and if those are not available they will simply have a few uncomfortable days. A very brief note - I will never post any opinion of mine, only facts as determined by reports in reputable peer-reviewed journals. I also won't post junk just to fill a day, I will restrict my coverage to what I believe are IMPORTANT developments which can save lives or suffering. If that means noting is posted on some days, so be it.